After filing a story only two hours after giving birth, and then getting straight back to full-time work the next morning, journalist Amy Westervelt had a revelation: America might claim to revere motherhood, but it treats women who have children like crap. From inadequate maternity leave to gender-based double standards, emotional labor to the "motherhood penalty" wage gap, racist devaluing of some mothers and overvaluing of others, and our tendency to consider women's value only in terms of their reproductive capacity, Westervelt became determined to understand how we got here and how the promise of "having it all" ever even became a thing when it was so far from reality for American women. 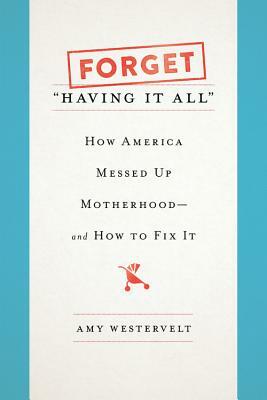 In Forget "Having It All," Westervelt traces the roots of our modern expectations of mothers and motherhood back to extremist ideas held by the first Puritans who attempted to colonize America and examines how those ideals shifted--or didn't--through every generation since. Using this historical backdrop, Westervelt draws out what we should replicate from our past (bringing back home economics, for example, this time with an emphasis on gender-balanced labor in the home), and what we must begin anew as we overhaul American motherhood (including taking a more intersectional view of motherhood, thinking deeply about the ways in which capitalism influences our views on reproduction, and incorporating working fathers into discussions about work-life balance). In looking for inspiration elsewhere in the world, Westervelt turned not to Scandinavia, where every work-life balance story inevitably ends up, but to Japan where politicians, in an increasingly desperate effort to increase the country's birth rates (sound familiar? ), tried to apply Scandinavian-style policies atop a capitalist democracy not unlike America's, only to find that policy can't do much in the absence of cultural shift. Ultimately, Westervelt presents a measured, historically rooted and research-backed call for workplace policies, cultural norms, and personal attitudes about motherhood that will radically improve the lives of not just working moms but all Americans. Amy Westervelt is an award-winning journalist with eighteen years' experience writing about health, psychology, technology, business, and environmental issues. Her work has recently appeared in Popular Science, Elle, Smithsonian, and Aeon. As a cofounder of Climate Confidential--an award-winning collaboration between six female journalists who syndicated environmental reporting to various national outlets--she helped get longform investigative environmental journalism into a host of national publications, including The Atlantic, Quartz, Smithsonian, Modern Farmer, and many more. In 2014 she was awarded a Rachel Carson Award for environmental journalism.